Greetings from China….wish you were here! 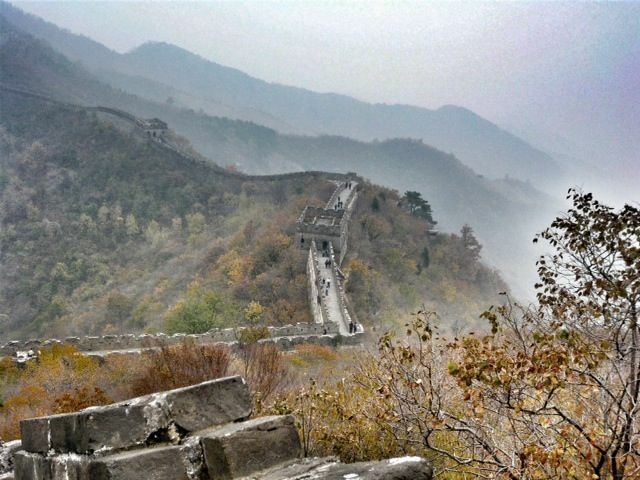 Photo taken along the Great Wall of China, November 2011. I took this photo last November on a very cloudy and polluted hike to the Great Wall. I look back at my 900 photos now and am depressed as they are all so incredibly gray. Yet that was what the weather was like there for an entire ten days. Smoggy, polluted and gray. If I close my eyes and imagine this picture on a clear day, I bet it would have been extraordinary with the fall colors. Oh, for another time! Nicole, I love this photo! The smog adds atmosphere and different layers of perspective. Great shot!